Your standard inkjet printer can mostly handle paper, occasionally transparencies, and maybe even blank DVDs while they were still a thing. But Xerox just revealed a towering machine it calls the Direct to Object Inkjet Printer because that’s exactly what it does—it prints on almost any 3D object. What makes the Direct to Object printer able to work its magic on surfaces that aren’t as flat as a piece of paper? Inside you’ll find moving print heads containing microscopic nozzles, half the width of a human hair, that can accurately spray ink at a distance of about a quarter inch. So whatever you place in the machine—be it as small as a bottle cap or as large as a football helmet—can be printed with custom imagery, at resolutions up to 1,200 DPI. Xerox’s Direct to Object Inkjet Printer uses special image processing algorithms to ensure that whatever’s being printed doesn’t get distorted or warped on curved or irregularly-shaped surfaces. And it works on objects made from plastic, metal, ceramic, and glass, removing the extra step of having to print on labels first, which adds time and cost to the process. 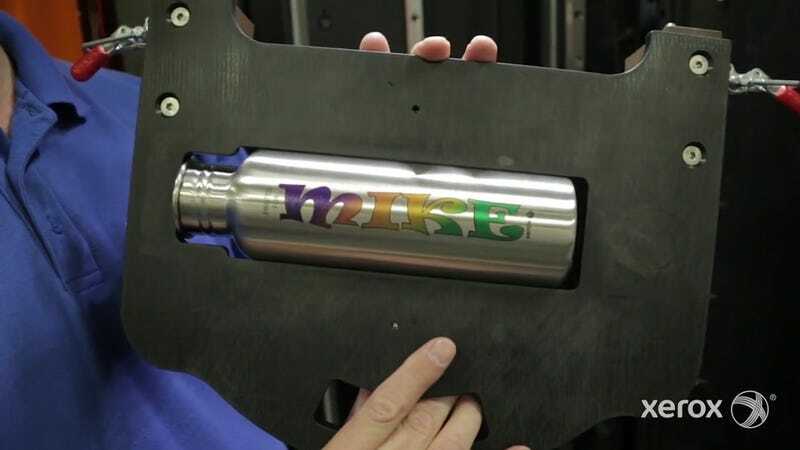 The giant inkjet printer can handle up to 30 objects an hour, so a factory wanting to add this to their line might need quite a few units to maintain their production numbers and output. And that’s where things will get costly. The printer itself comes with a price tag starting at $145,000, and you can only assume what the replacement inkjet cartridges might run for it, given the exorbitant cost of the ink used in your home printer.